The Wurzels aren’t the only big Somerset name hoping to make the crowds smile at a popular West Somerset festival this coming August bank holiday weekend. Watchet LIVE Festival is gearing up to welcome none other than Sparky the Dragon and Somerset County Council’s professional and friendly Fostering Recruitment Service in to spread the word about Fostering to its 4,000-plus visitors. The Festival (Friday 26 to Sunday 28 August 2016) is supporting the search for more Somerset people to become Foster Carers for vulnerable children. It is hosting a special stand in its Family Zone on Saturday 27 and Sunday 28 August, with the Council’s very own Sparky on hand to give out fostering goodies. Sparky will be joined by our friendly Fostering Recruitment Service and our enthusiastic Foster Carers. Festival-goers will also get the chance to add their good wishes for children and young people in care to our Wish Tree. The tree, which has been generously donated by Wyevale Garden Centre at Norton Fitzwarren, will be planted for the children at a later stage, at a yet-to-be-confirmed location. Offer an older child aged 10-plus a loving home. Give teenagers guidance and stability as they mature into adulthood. Help siblings of all ages stay together. Offer disabled children new experiences and give parent carers a break. Help a parent and their young child. Cllr Frances Nicholson, Cabinet Member for Children and Families at Somerset County Council said: “We’re very grateful to Watchet Festival for helping us raise awareness of the pressing need for people to come forward to foster. “We know many people are looking forward to having fun at the festival over the August bank holiday, and we really hope to send them away with food for thought. Or come to our next information event on Monday 12 September, 7pm to 9pm at Taunton’s Holiday Inn, Deane Gate Avenue, Taunton, TA1 2UA. Watchet Festival is completely Sold Out and there will be no more tickets available in advance or on the gate. For more information about Watchet Festival, email Michael Eccleshall on michael@eccleshall.net or phone 020 7450 1532. 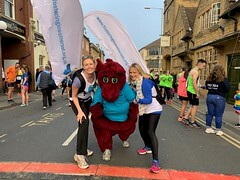 Trevor Goss and Daisy Blacklock from the Fostering and Adoption Recruitment Service at Somerset County Council, and Sparky the Dragon, who will be making his way to Watchet Festival with the Fostering and Adoption Recruitment Service.